NO MONTHLY FEE. NO ACTIVATION FEE. Price includes device and one year of service. Same amount for renewal in the second year. One year 24/7 Service and 3G data plan throughout US, Puerto Rico, Mexico, Canada (supported in 38 countries). GEOFENCE Zone arrival and departure notification. Create zones on the map where your drivers are delivering products or services and get notified by email or push notifications. Address on the map and trip table for start and end points. Fuel economy, fuel level reporting, fuel cost tracking. Vehicle maintenance reminders. Custom maintenance tracking. Driver speeding/braking/rapid acceleration and safety scoring. Speeding alerts. Trip and other data download in Excel readable format. Web-based fleet management and iOS/Android apps. Check on fuel economy and find out the reason behind poor economy. Fuel level and Fuel cost tracking. Powered by Agnik's Patented technology. Winner of: 2016 Fleet Logistics Tech Outlook Top-10 Fleet Management Solution Provider, CIO Review 2015 20 Most Promising Automotive Technology Solution Providers, 2010 Frost and Sullivan Enabling Technology of the Year Award. No Monthly Fee! Free Shipping! No Contract! 3G OBD-II Realtime Car GPS Tracker Device. SIM card, 1 year of data plan, and 1 year of service Included. Comes with web account for desktop computers and Android/iOS apps. Use VyncsFleet to monitor more than 5 vehicles. 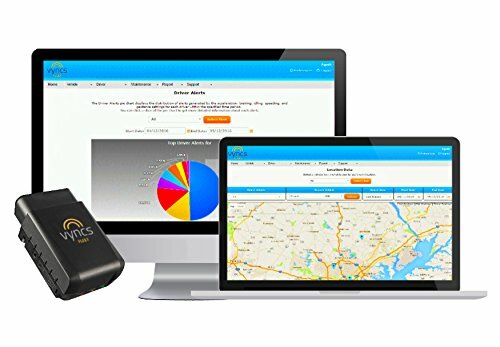 Full service connected car product with Real Time Car GPS tracking, Google map, 3 minutes Real-time GPS with 60/30/15 seconds GPS update upgrades available. No battery needed! That means no painful charging and recharging of device. Draws power from OBD-II port. Goes to sleep after car ignition is off but wakes up once in every hour (when the car-ignition is off) to update location in your account and then goes back to sleep again. 3G wireless connection supported in 38 countries including all 50 US States, Puerto Rico, Mexico, and Canada. SIM card included along with 1 year data plan. You pay the same amount for renewal in the second year. Fleet dashboard, unlimited number of vehicles per account, street address on trip table, downloadable data in Excel-friendly format, fuel cost tracking, creating custom maintenance tasks, more scalable software and powerful infrastructure for fleets, stop time reporting on the map, true idle time (vehicle not moving but engine running) reporting on the map, multiple sub-fleets with more than one managers and due access control. If you have any questions about this product by VyncsFleet, contact us by completing and submitting the form below. If you are looking for a specif part number, please include it with your message.